See guest artist Claire Kelly in a live, narrated demonstration in the Amphitheater Hot Shop on February 5 from 3 to 5 pm. 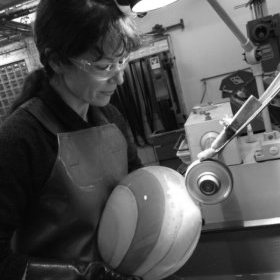 A frequent instructor at glassmaking schools around the country, including The Studio at The Corning Museum of Glass, Kelly has been working with glass for more than 20 years. Kelly, whose work has been exhibited internationally, has been working with acclaimed glass artist Toots Zynsky since 2008 and is currently exploring a new body of work. Claire Kelly’s work examines the human connection with animals and their larger relationship to our world and environment. She has created a series of “fantastic microcosms that bring a consciousness to their decorative status,” she says. “My sculptures tell a story about the fragility and conservation of these small worlds as well as describing their role in a grander scheme.